I had a recipe request after someone saw my Sunday week in review and thought these looked good. In my Sunday Week in Review, I often post pictures of food we ate during the week with the caption something along the lines of "recipe to come soon". Sorry if you have been holding your breathe for some of those. I just do so much experimenting that I get excited about the next thing (I'm on a gelatin kick right now) and then I never get around to going back and posting old recipes. Or my kids color on my notes and they end up in recycling. Or I intend to write down the recipe and by the time I get around to it my brain has emptied any knowledge of the ratio of ingredients. Long story short.......if there is a recipe you really want it would be a good idea to follow up with me right away and ask for it. Like my awesome friend Lori. I found the quinoa puff cereal at the Bulk Barn. It is unsweetened. You could replace the quinoa with any unsweetened puffed cereal you want but try and stick to the non-glutenous grains. And sorry - but if you are on the Candida diet and come here for ACD recipes - this is not one of them. These were for my kids. Yes - some rolled off the counter and into my mouth by accident. But I paid with a Candida flare up so don't do it. This is really just a base recipe. You could replace the almond butter with another nut or seed butter. The honey with another sweetener. The sunflower seeds with another seed or nut. Use your imagination. Raisins, coconut, cacao nibs - or whatever you have in your pantry. 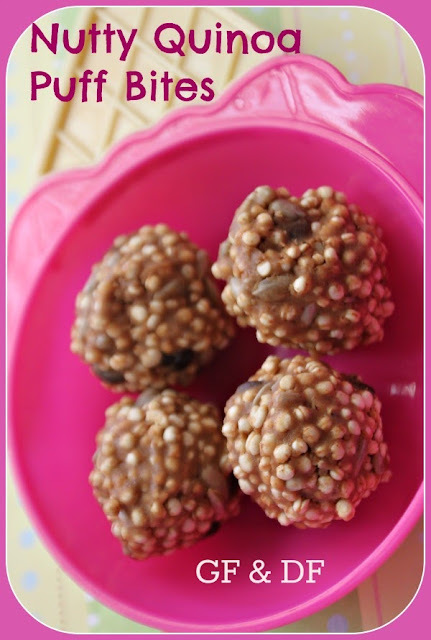 These were easy to make (really) and are a great healthy snack for the kids. Much better than processed granola bars that are full of sugar and who knows what else. So make these for your kids. Or make them for yourself if you can handle it. Combine quinoa puffs, sunflower seeds, cranberries and chocolate chips in a large mixing bowl. Combine almond butter, honey and vanilla in a microwave safe bowl. Add nut butter mixture to quinoa puff mixture. Rolls into balls - about 1 to 2 Tbsp per ball. sounds interesting!!!!!!! cant wait to try it! Sounds nice but honey isn't vegan.